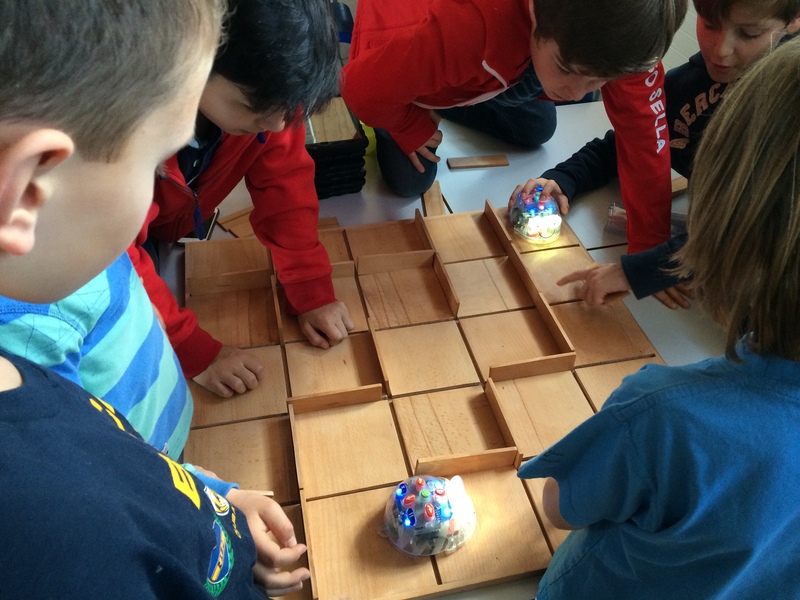 Last month our school received a new shipment of BlueBots…the 2015 version of the former BeeBots. These bots have only just been released and provide the added feature of being programmable via an iPad (using BlueTooth). The bots also have a transparent cover, allowing children to see the computer inside as it works. Otherwise, it operates and is programmed mechanically the same way the BeeBots are. This video is a collection of examples for how the BlueBots were used in EY, G1 and G5. 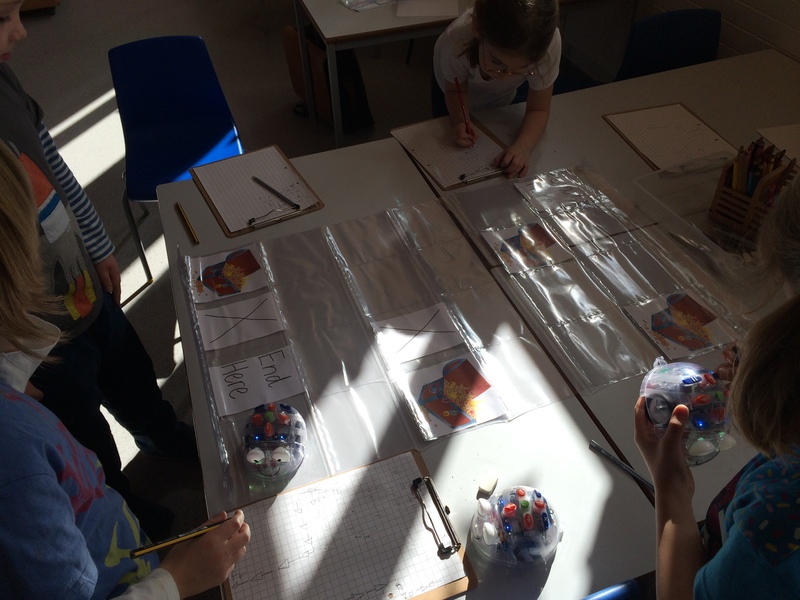 The Grade 1 teacher, Rebecca Navarro, paired her students up with their G5 buddies to inquire into these bots. None of them had any prior experience with BeeBots, so they were intrigued when they saw them in their classroom. Without instructions, the students set off to find out how these bots worked and what they could do. Before long, a group of students had teamed up to figure out how to code the bot so it followed a series of instructions. They were ready for the next step..assembling the Maze and creating a path for the BlueBots to follow. 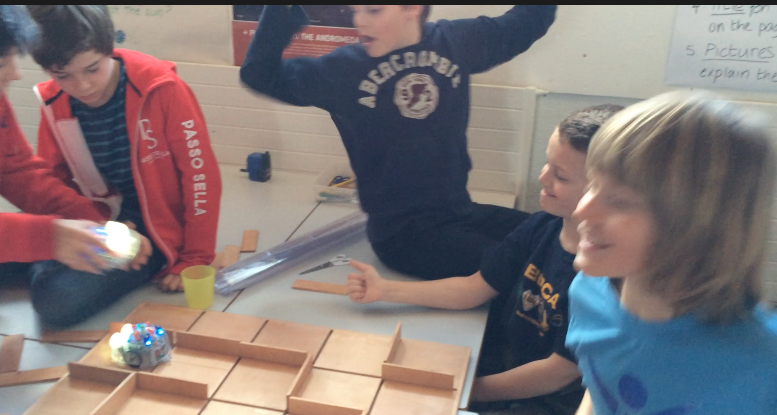 It took several tries but eventually one pair of students managed to do it. 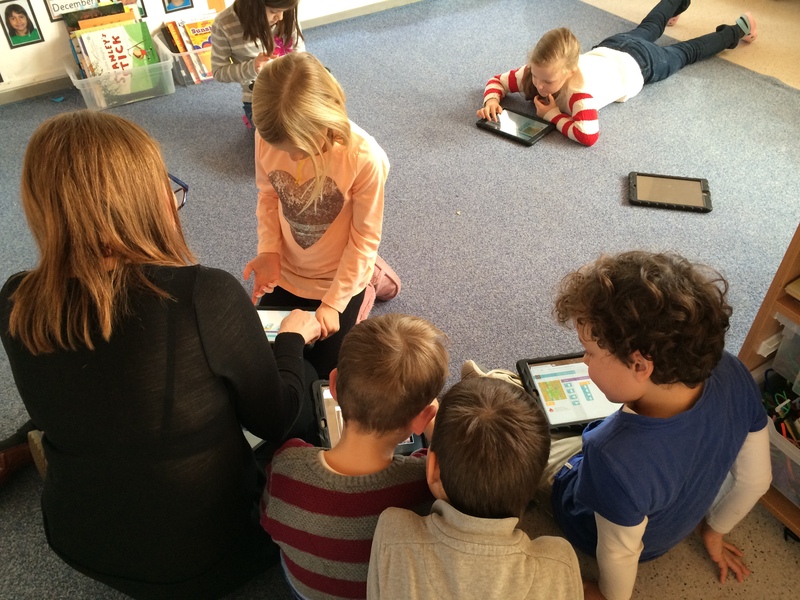 The following lesson, Ms. Navarro set tasks for her grade 1 students to work through 3 coding stations. One group practiced their coding on iPads, another group worked with the maze to write coding directions for the BlueBots, and the third group worked on the clear plastic floor mat to code their bots to move towards the treasure. Ms. Navarro then brought the students back together and discussed the language of direction that’s used when coding with BlueBots. Synthesising the learning from the three activities, and reviewing this new vocabulary helped solidify the students’ understanding of why language is important when we communicate, especially when trying to program a BlueBot to do something. She drew connections to math and literacy and it was clear at the end of her lesson that students were prepared to tackle these challenges again with new tools to assist them. We haven’t introduced programming the BlueBots with the iPads yet but the app has been downloaded and has been tested. Once the students gain a better understanding of how to program them manually we will move on to programming them digitally. 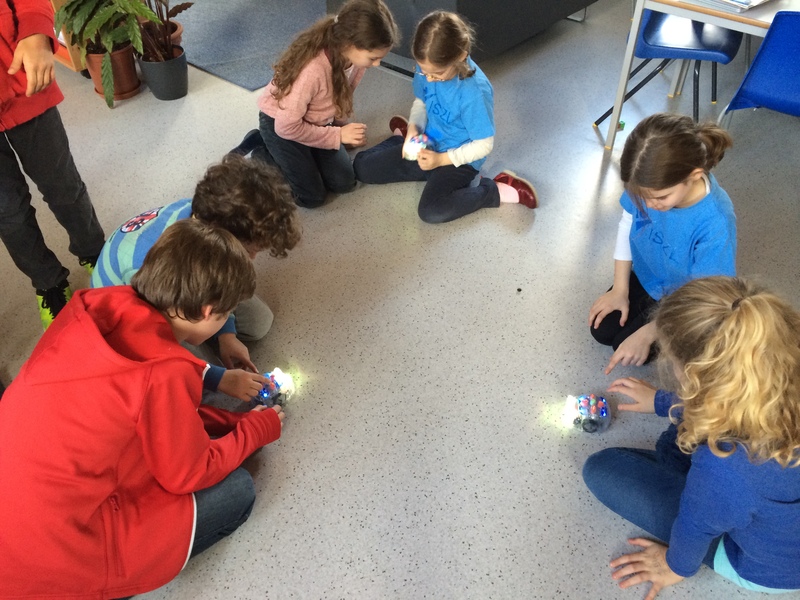 Earlier this year, EY1 students had a chance to explore BeeBots for the Hour of Code week. 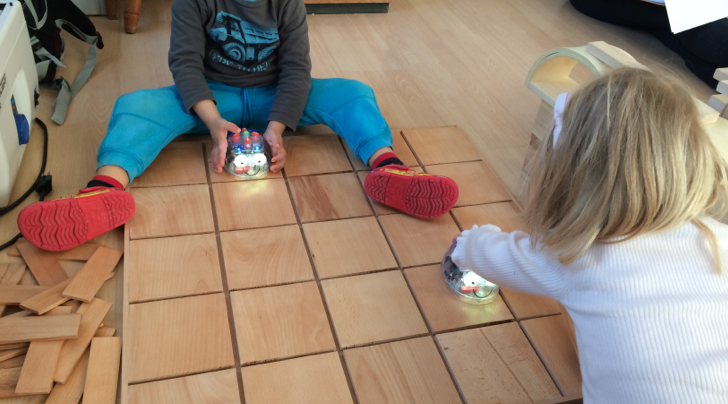 We decided to give them a chance to play with the new BlueBots to extend their learning and hopefully make new connections to the way the robot moves, since the body of the BlueBot is transparent. I wasn’t able to attend the initial classes but the three I did attend were very revealing. It was clear that the BlueBots were popular and many of the children were working to share them or build houses for them. 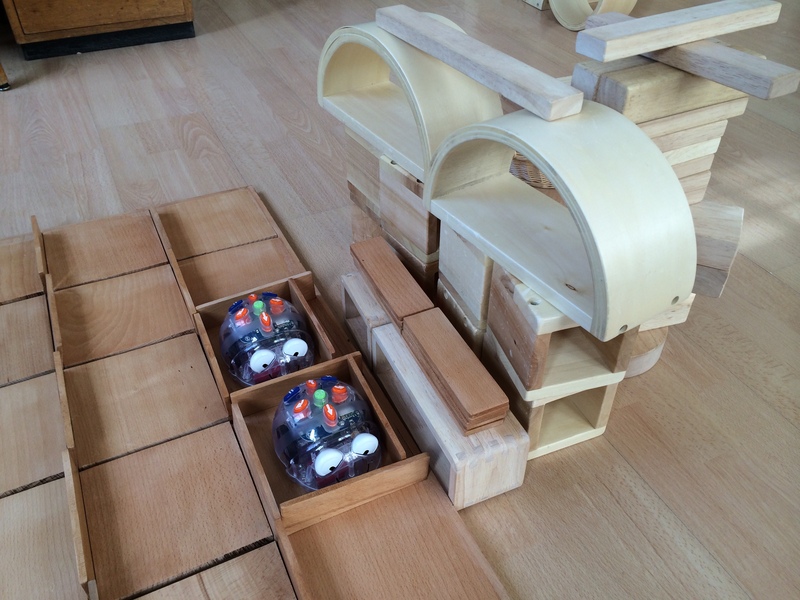 One student had taken two BlueBots and set up a race-track for it using the maze. When the Bots were ‘resting’ she boxed them in using the manoeuvrable maze walls. She then built an elaborate ‘house’ next to them and eventaully moved on to continue her construction elsewhere in the room. As the BlueBots were left, other children came over and tried to use the maze as a race track. 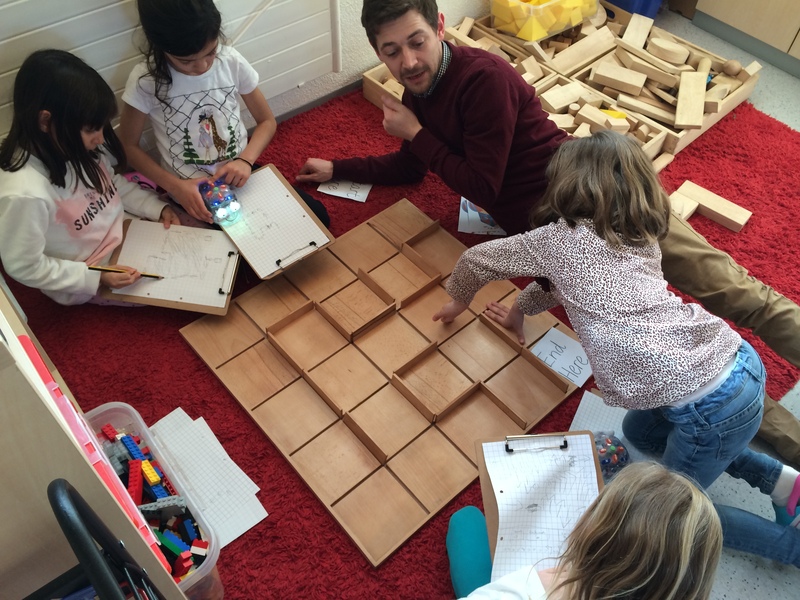 One child began counting each square to help him program the bot. He noticed that the bot kept going too far and at this point I intervened and showed him that the square the Bot was on was actually square “Zero” (not square “One”). He quickly adjusted his counting and was very proud when the Bot managed to make it to the edge without falling off! Later I overheard him showing another student that the first square was “square zero”. One student explored programming the Bot without looking at the arrows. I couldn’t work out if he was actually trying to map out the direction it might move, or if he just wanted to see what would happen. In any case, when he pressed the green GO button, the BlueBot followed a series of turns and forward steps without falling off the maze. Overall, it seems for the younger students that more time is needed to explore and inquire into the BlueBots. 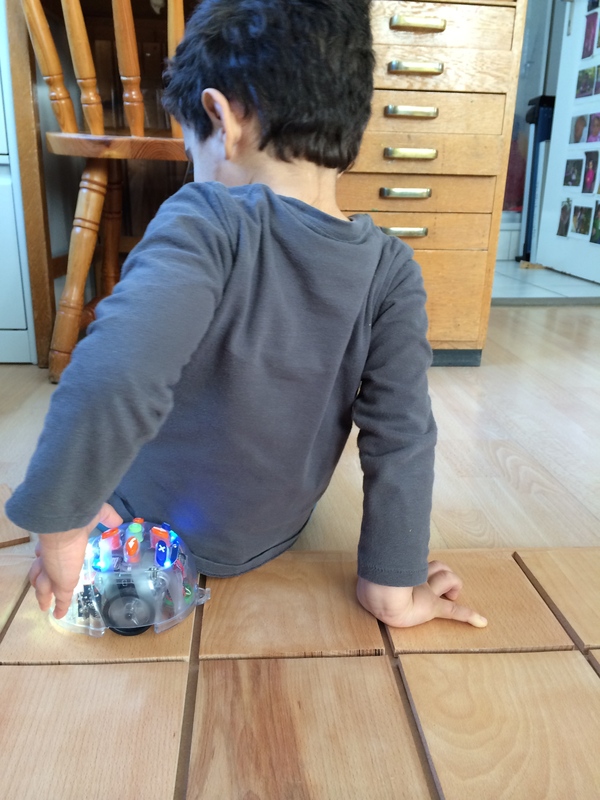 Some children still want to force the Bot forward if it’s not moving the way they want…luckily they are durable and have already withstood several forced movements and even being stepped on by 3 year olds! 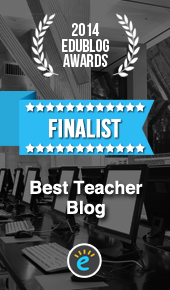 The teachers have decided to take a break from this exploration for now, but perhaps will revisit it at a later time. One main (and perhaps my only) criticism I have of the BlueBots (and BeeBots) is that they are not easily stopped once they are in motion. There is an “X” (cancel) button on the bot but it doesn’t stop the Bot in its track. The Bot will run through the entire coding set until it’s finished then it will stop. We’ve tried the PAUSE button also and it won’t interrupt a coding sequence. 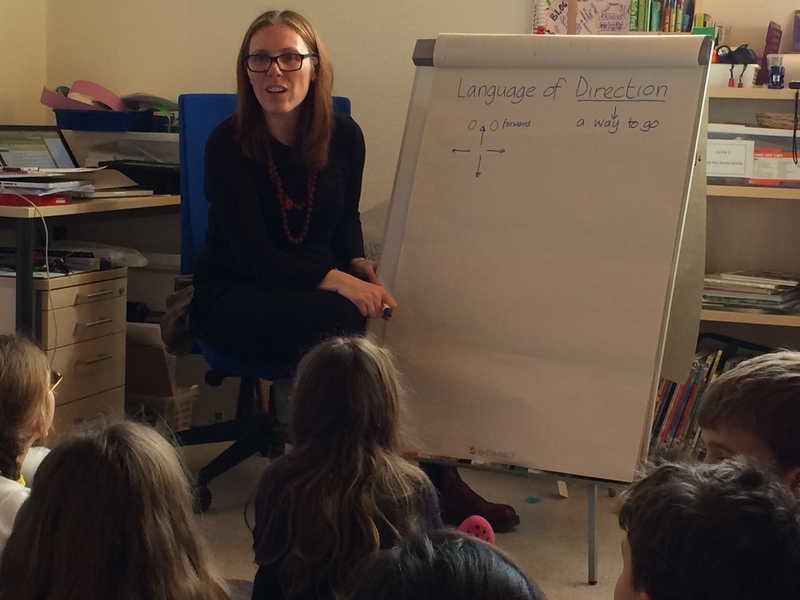 Many children want to immediately stop their Bot when they notice a mistake but we’ve resorted to flipping the Bot over, switching it on/off and starting again, which interrupts the flow. Perhaps the next version can introduce an easier way to correct the code!